My daughter chose to celebrate her 13th birthday at Mickey’s Halloween Party in Disneyland Park. We let her pick a special birthday dessert. 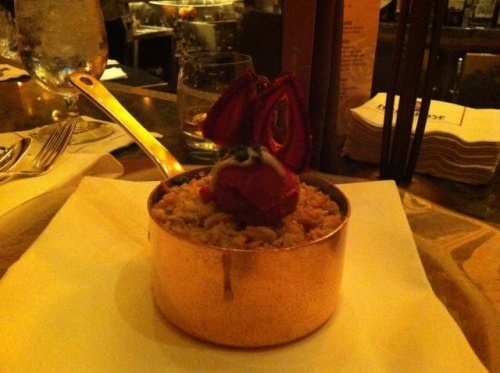 First, we ducked into the Red Rose Inn to look for something sweet. However, she didn’t find anything that appealed to her here. 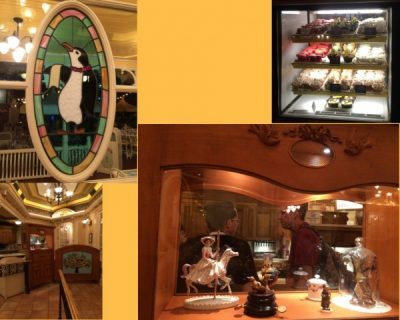 We went over to the Jolly Holiday Bakery Café, a favorite of ours on the end of Main Street, U.S.A., where it borders Adventureland. 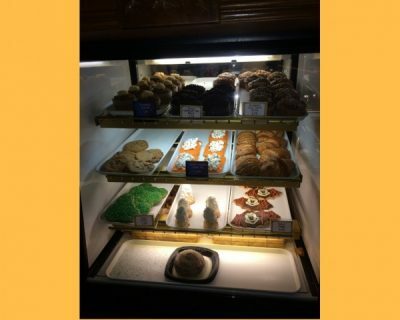 They always have a pastry case full of delicious goodies. The Jolly Holiday, as you might guess from its name, is themed towards Mary Poppins. There is no interior seating here, but the queue area and ordering stations are so pretty! When we saw the display case, my daughter was almost overwhelmed by the choices. In the end, she settled on the Mickey Mummy Macaron, for $5.99. It’s two vanilla macarons with a creamy cookies and cream center. We also asked for two cups of ice water. It was dark and pleasantly cool outside when we found a small round table. The exterior was lit with orange and white colored lights to keep with the Halloween theme. As you can see, it’s adorable. The googly eyes were edible, and my daughter says they tasted more crumbly and less chewy than she expected. She ate almost the entire thing, but declared she was too full to finish it. My husband and I both took one bite each. My daughter absolutely loved this dessert. She has an enormous sweet tooth and is a huge fan of both white chocolate and cookies and cream . One of her favorite candy bars is Hershey’s Cookies and Cream. So the flavor profile was exactly what she wanted. Me, not so much. In my book, when it comes to chocolate, it’s the darker, the better. I found this dessert to be so sweet as to be cloying. I found myself gulping down ice water to try to clear the sugary sweetness from my mouth. 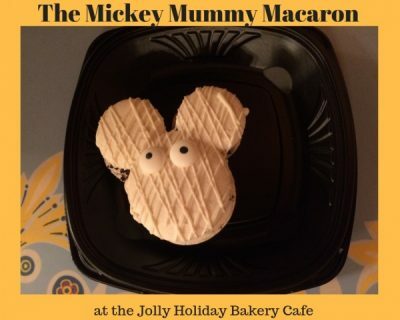 So, if you love sweet, if you love white chocolate, if you are a fan of cookies and cream and have an extreme sweet tooth, you will love the Mickey Mummy Macaron. If you’re like me and are not a fan of the extremely sweet, this is not for you. I’d go for the Raspberry Rose Macaron (which has a bit of tartness to it), the fabulous Matterhorn Macaroon (small but bursting with coconut), or the Graveyard Cupcake (which combines rich dark chocolate and cherries) instead. What’s been your favorite Halloween-themed sweet treat at Disneyland? Is it the Mickey Mummy Macaron? Share in a comment below or on Facebook or Twitter. Want to visit Disneyland? Contact The Magic for Less Travel for more information and a free, no-obligation quote.